ATHENS, Ga. (AP) — There’s never been a better time for Kirby Smart to tell his Georgia players the focus is on them, not the opponent. It’s a much-repeated mantra for the Georgia coach that should hit home with players as they begin preparation for Saturday’s visit from UMass. After completing a stretch of seven straight Southeastern Conference games, including last week’s 27-10 win over Auburn , No. 5 Georgia (9-1, No. 5 CFP) will close its regular season with nonconference games against UMass and Georgia Tech. Players might be tempted to look ahead to the Dec. 1 SEC championship game against No. 1 Alabama even before the state rivalry game against Georgia Tech. It could be even more difficult to remain locked in on the Bulldogs‘ first game against the Minutemen. The opening betting line listed Georgia favored by 45 points for its first meeting with UMass. Smart recognizes focus could be a challenge this week. UMass (4-7) is coming off a 35-16 home loss to Brigham Young . The Minutemen lost at Boston College 55-21 on Sept. 1 in their only game this season against a Power Five team. It is clear Smart’s players have practiced their answers about not looking ahead. “The next one is the biggest one,” said wide receiver Tyler Simmons. “I wouldn’t say it’s the biggest one, but it’s the biggest one right now,” Simmons said with a smile. Georgia has won three straight games, including against No. 15 Florida and No. 20 Kentucky, since its only loss at No. 10 LSU on Oct. 13. The Bulldogs’ biggest motivator the next two weeks is to protect their national championship hopes. 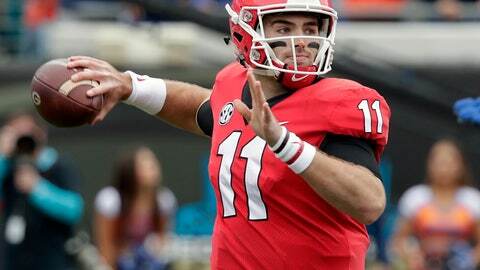 Quarterback Jake Fromm doesn’t want to see the Bulldogs stumble against UMass. Apparently that assumption has made its way through the roster.